If you live in Louisiana, your primary objective in raising a home is likely to be flood avoidance, even if you’re not in an identified flood hazard area. 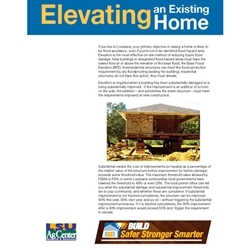 Elevation is the most effective on-site method of reducing future flood damage. To view pdf, click here. A free copy of this publication may be available for pickup at your parish LSU AgCenter office. Click here for a list of our parish offices. Shipping directly to you is available for a $1 plus postage and 10% tax.